Home > Blood borne virus transmission risk. Outcomes measurement tool: drug use behaviour – safer use. 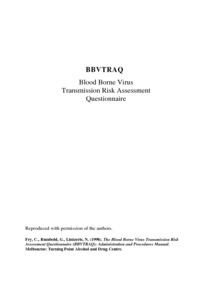 Fry, C and Rumbold, G and Lintzeris, N (1998) Blood borne virus transmission risk. Outcomes measurement tool: drug use behaviour – safer use. The BBV-TRAQ assesses the frequency with which injecting drug users have participated in specific injecting, sexual and other risk-practices in the previous month that may expose them to blood-borne viruses. The instrument consists of 34 questions that make up three sub-scales measuring frequency of current injecting risk behaviours (20 questions), sexual risk behaviours (8 questions) and other skin penetration risk behaviours (6 questions).